This week is MIT’s spring break, so I’m home for a six days of stuffing my face. First up? 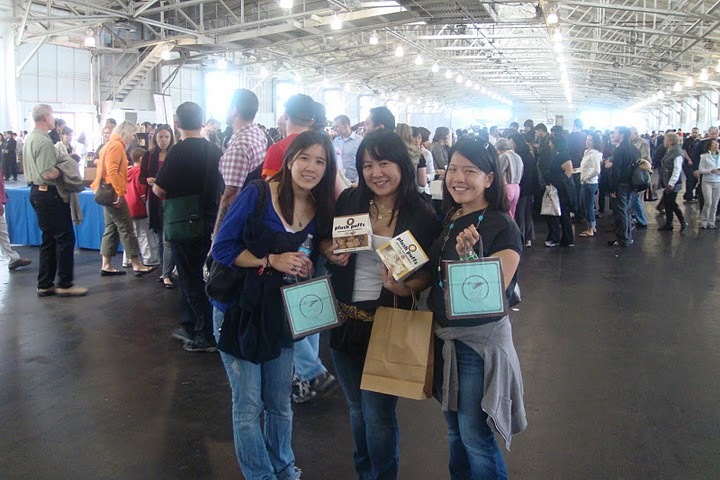 The San Francisco International Chocolate Salon. 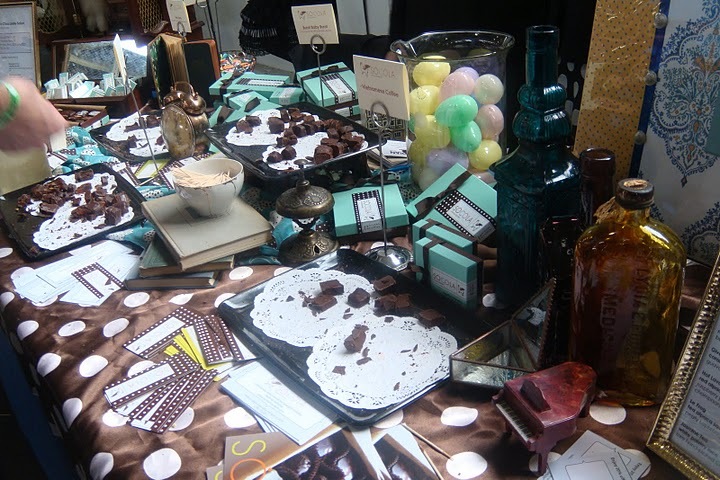 Tons of chocolatiers from near and far came to offer samples and sell their wares. 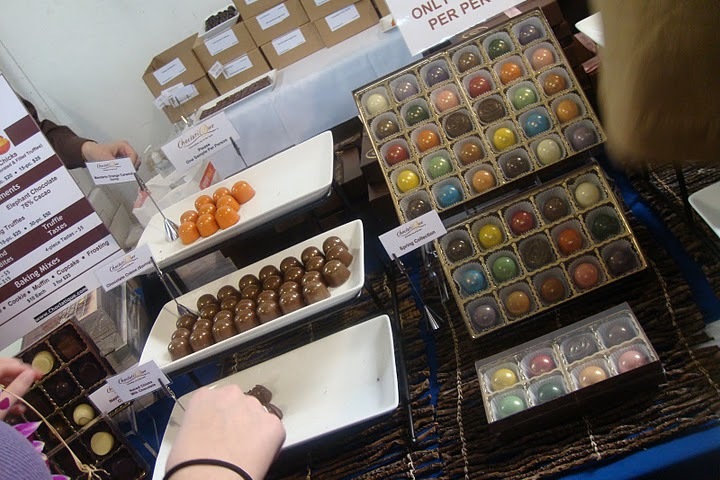 There were dark chocolates, milk chocolates, white chocolates, marshmallows, truffles, caramels, toffees, and everything in between. In other words, a dream come true. Unfortunately, I’d left my camera in my dorm room back in Cambridge, so all of these pictures were taken by the lovely Anne. The day started with a stop at the Socola booth. 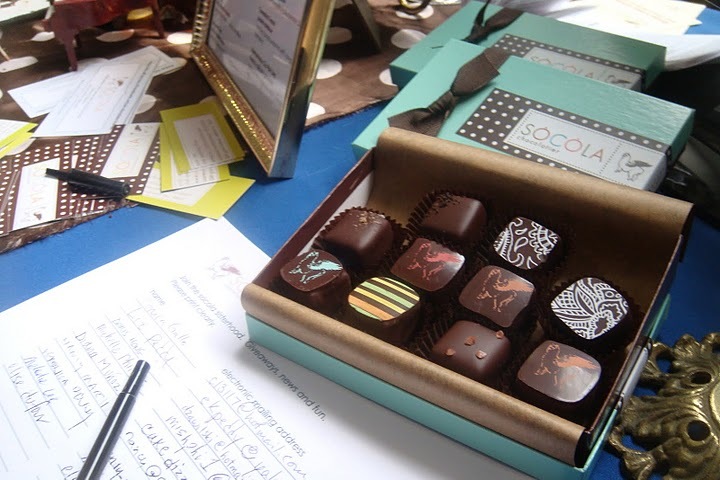 Socola, which means “chocolate” in Vietnamese, is run by two sisters in Oakland who hand-make all of their chocolates. I absolutely LOVED Hot Lava, the truffle with raspberry pate de fruit and champagne. 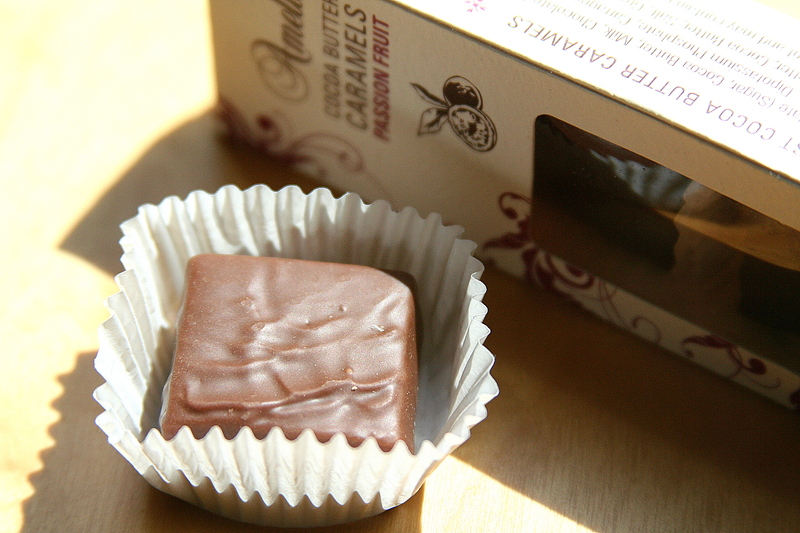 The raspberry flavor dominates the truffle, and the champagne flavor is much more subdued. I bought a 12-pack with Hot Lava, Give it to me Guava (guava pate de fruit), Jasmine Tea (with err…jasmine tea), Shakesbeer Stout (Rogue Brewery Shakespeare Stout), and Vietnamese Ca Phe Sua (Vietnamese espresso with condensed milk). Next up was arguably the best chocolate I ate all day. 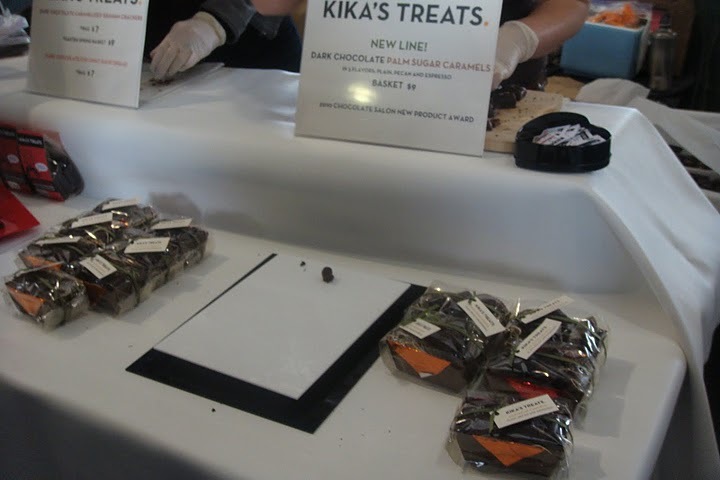 Kika’s Treats had a new product — a dark chocolate palm sugar caramel that was mindblowingly delicious. The caramels were chewy with a very deep flavor and, luckily for me, they weren’t too sweet. Apparently, everyone else at the salon thought so too, as their sample tray was almost always empty. 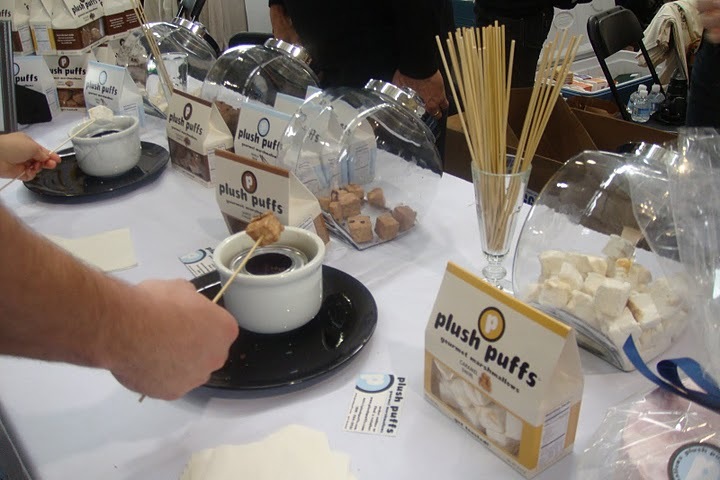 They also had caramelized graham crackers, which were great as well. I really wanted to bring some home with me, but at $9 for a pack of 3 caramels, the price was too steep. 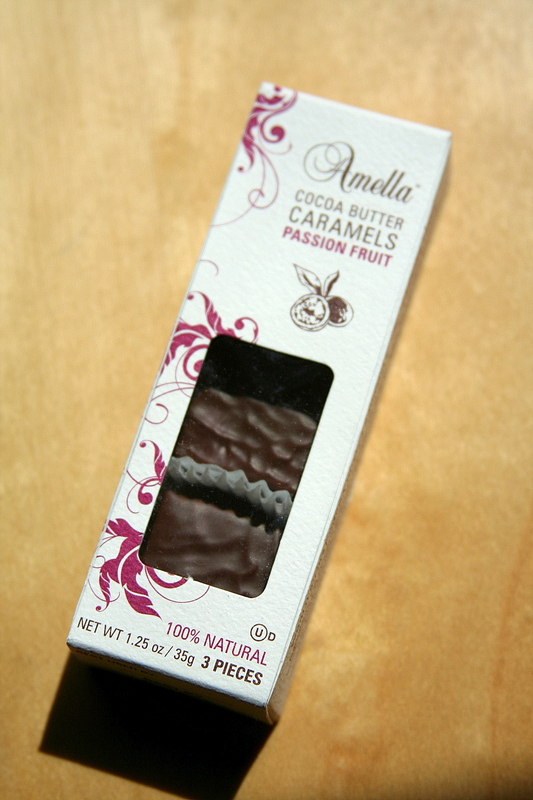 These passion fruit caramels from Amella Caramels came a close second as my favorite chocolates at the salon. Passion fruit is, in my mind, the world’s most wonderful fruit, so I might be a little biased. The flavor in these caramels was a bit too much, completely overpowering the taste of chocolate wrapped around them. 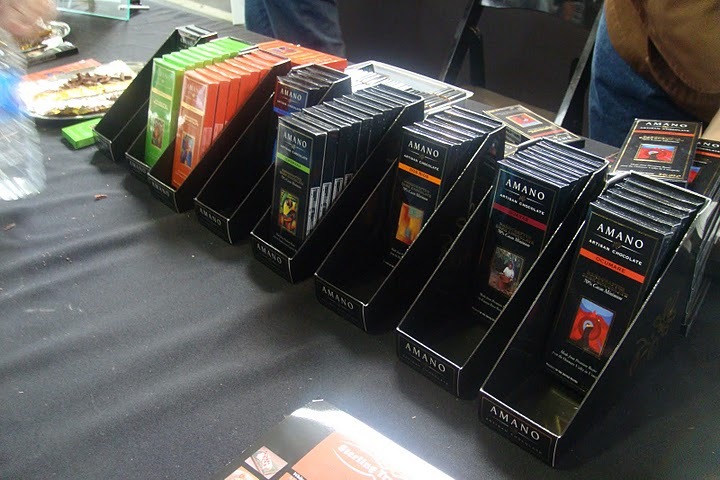 Amella had a bunch of other fruit caramels as well, but we didn’t get a picture of their display. This is the caramel that I bought. 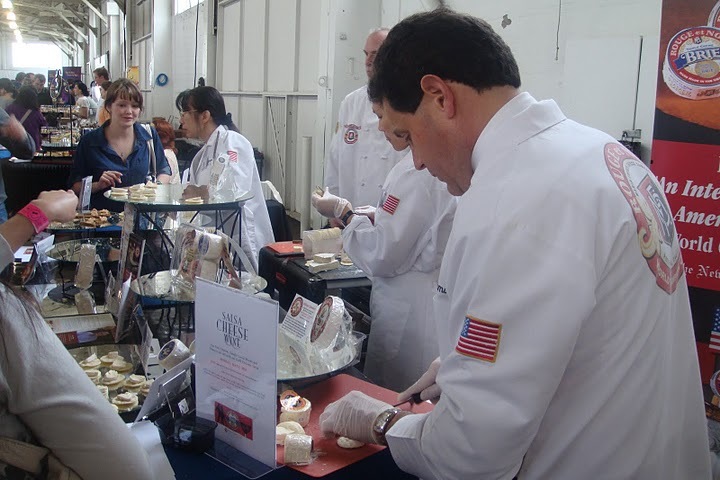 Cheese samples from Marin French Cheese was a welcome savory break. Their brie was especially good, and I discovered that goat cheese is most definitely Not My Thing. 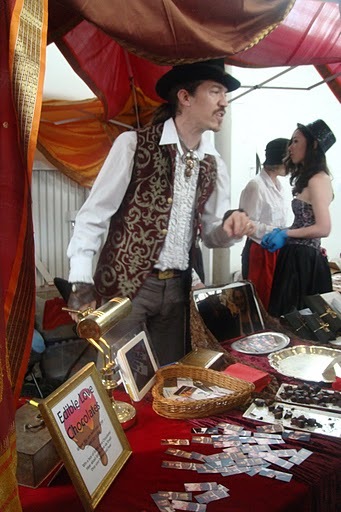 These guys from Edible Love Chocolates came in full costume with a big velour tent as their display–intense. I tried their absinthe truffle, which was waayyy too strong for my tastes. I’m sure Bobby would’ve liked them, though. I don’t particularly remember many of the other chocolates because after about an hour of tasting, my brain had just about melted from chocolate overload. Following are a few more pictures from the event. I found bananas at Haymarket last weekend for $1/10 bananas. Why any one single person would ever want ten bananas is beyond me, but I saw the slightly bruised beauties and immediately thought BANANA BREAD. After much internal struggle to decide whether chocolate chip banana bread or raisin+walnut banana bread is better, I caved and just made both. The recipe I followed yields enough batter for three mini-loaves, but I guess Bobby’s two full-sized loaf pans were too big for the batter. The result? Two rather flat loaves of banana bread. Sift together flour, sugar, baking powder, baking soda, and salt into large bowl. In a separate bowl, combine mashed bananas, eggs, buttermilk, oil and vanilla. Mix dry and wet ingredients until a smooth batter forms. Divide batter among loaf pans and stir in desired ingredients (chocolate chips, raisins, walnuts, baby fingers, etc.). Bake for 35 minutes or until deeply golden brown and toothpick inserted into center comes out clean. Sadly, all of my chocolate chips sank to the bottom of the batter and I ended up with essentially a layer of chocolate and a layer of bread. Fortunately, the flatness of the bread makes it so you can take a vertical bite and get both flavors in a single mouthful. “But the chocolate chips are all on the top of the bread in the following picture!” you say? That’s because the loaf is upside-down, silly. My bad. All in all, this banana bread is pretty tasty. The chocolate chip loaf was a little too sweet, so next time I’ll have to cut back on the sugar. It’s a very moist, cake-y bread, and perhaps a little too chewy for my taste. Perhaps I’ll shorten the baking time and add a little more baking powder for more leavening power next time.